The Royal Opera’s Associate Director John Fulljames invited students from the RCA’s MA programme in Critical Writing to explore his production of Weill and Brecht’s Rise and Fall of the City of Mahagonny. Writers from the Royal College of Art have explored The Royal Opera’s new production of Rise and Fall of the City of Mahagonny in an unprecedented collaboration between the Royal Opera House and the RCA. John Fulljames, Associate Director of Opera for The Royal Opera, invited students from the RCA’s MA programme in Critical Writing in Art and Design to investigate aspects of his new production of Weill and Brecht’s stinging satire on consumerism. The RCA’s postgraduate course offers students opportunities to discover – and create – new ways of writing about contemporary art and design. The 15 writers explored aspects of the production with the creative team and John Snelson, Head of Publishing and Interpretation at the Royal Opera House, to produce a portfolio of essays of remarkable breadth and diversity – embracing such aspects as Brecht’s relationship with Charlie Chaplin, the everyday violence of boxing and the lure of Las Vegas (one real-world version of Mahagonny). Student Rosanna Mclaughlin was interested in the opera’s popular ballad the ‘Alabama Song’, calling card of the prostitute Jenny. She spoke to singer Christine Rice about how the song’s smooth and easy melody sits at odds with the text. When David Bowie sings the ‘Alabama Song’ – cigarette in hand and brow furrowed, a vision of brooding intensity – Jenny’s shiftiness is absent. The lyrics have changed, too. The opening line of the third verse, originally ‘Oh, show me the way to the next pretty boy’, has become ‘Oh show me the way to the next little girl’. Bowie borrows both lyrics and attitude from The Doors’ version, and Jenny’s wry call for the next ‘pretty’ john is updated to fit with rock-and-roll’s familiar triad of wayward morality: drugs, money, and – of course – young, female flesh. While Jenny remains detached from the role she knows she must perform, Bowie and Morrison inhabit the song as a type of self-portraiture. In doing so, they enact popular culture’s consummate feat: the ability to absorb criticism and assume it as an attractive feature. Student Molly Richards was intrigued by the extensive use of projections in the production, and the place of this relatively new technology within opera’s history as a spectacular art form. She spoke to Finn Ross, video designer of the production, about the need to integrate projections within the other stage languages at play in opera. Wagner’s vision of artistic synthesis [in The Artwork of the Future] means responding to growing technological opportunities and accepting them into opera’s multiple characteristics. Wagner wrote about the imperative for opera to reveal a deep, integrated statement of sociological truths. In Mahagonny, where brands are the monarchy and currency is power, adverts package the city and civilians are commoditized, it doesn’t sound too dissimilar from the world outside the Royal Opera House. Ross mentions that from the first musical note the audience see projected images on top of the gauze, perhaps an echo of today’s screen obsessed culture. Acknowledging that the story is one of excess, does the extravagance of technology also become excessive? Ross spoke about the synthesis of multi-media with other elements. Student Thea Smith was struck by the difficulty of creating the desolation and squalor of Mahagonny within the plush surroundings of the Royal Opera House. She spoke to Fulljames, who argued that this contradiction between the illusion on stage and the reality of the audience’s surroundings is all part of Brecht’s ideas of epic theatre. So how does the opera challenge the frame? There’s a sense that the frame is supposed to contain the production in some way. Spilling out through the proscenium is a postmodern cliché that Fulljames avoids, preferring to use the architecture radically: the frame tries to define a set of spatial rules but this production of Mahagonny doesn’t accept them. When the city is built [in Act II] there is a sense that the containers don’t fit on the stage – they’re multiplying out through the wings, there’s a sprawl of furtive backstreets and alleyways we’re not party to. You can read Oscar Gaynor’s full article on whiskey and debt in Mahagonny here, and more from other students in the RCA programme in the digital programme for Rise and Fall of the City of Mahagonny. 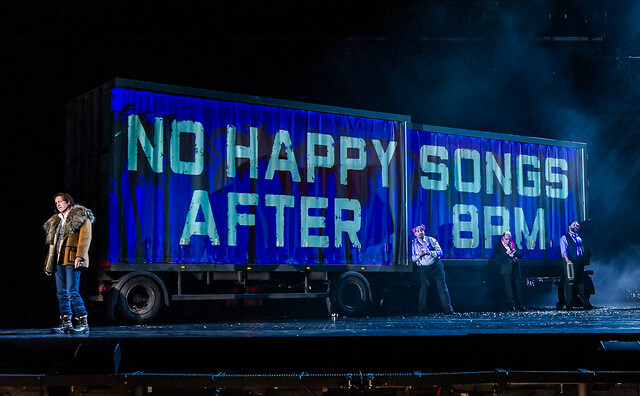 Rise and Fall of the City of Mahagonny runs until 4 April 2015. Tickets are sold out, but returns may become available and there are 67 day tickets available for each performance.